Here are 5 tips to help you find more morels and to help make you a better morel hunter. 1. 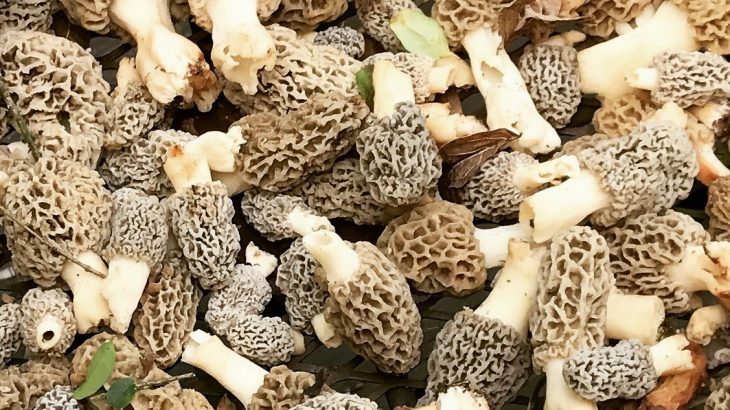 Timing is Critical – Depending upon your geographical location in the country, the morel mushroom hunting season can start anytime from early to mid-March and run into late June. Unfortunately the date of the first sighting in your area can vary by several weeks each year so you can’t count on finding them using that date you marked on your calendar last year. The key is to have a week or so with daytime temperatures in the 60’s and night time temperatures in the upper 40’s. It is at this time the ground temperature reaches the low to mid 50’s which is the optimum growing condition for morels. Some rain to moisten the soil is required but it’s a myth is that you need the sun to really “pop” them. Some of my most productive seasons have been cloudy, rainy springs. Besides, everyone should experience mushroom hunting in the rain. The fresh smell of the woods, the sound of the rain on the Mayapples, the overwhelming feeling that you are one with the woods…..…absolutely nothing better! 2. Don’t Forget Technology – With a growing season that typically lasts only a few weeks and a start date that can vary as much as 4 weeks, it’s very easy to miss the season altogether. If you want to be sure not to miss the “pop”, use technology to your advantage. There are many websites that have morel sightings maps. (including TheGreatMorel.com) Use the sightings map to track the progression of morels from the warmer climates to the cooler states. In the U.S., morel mushrooms are found in abundance from central Georgia northward into Michigan, Wisconsin, Minnesota, and Vermont and as far west as Oklahoma. Lets not forget the Pacific North West which is also a hot bed for morels. By regularly visiting The Great Morel’s sightings map you can track the morel progression from the southern states through the northern states. Many of the sightings maps even allow you to expand into county view to really pin point the start of the season in your area. The sighting map can also heighten the anticipation of the new mushroom season. Watching the sighting pins move closer to you each day is like the child opening the window each day on the Christmas calendar in anticipation of Santa! 3. Tune your Eyes Prior to the Hunt – It’s called imprinting. Have you noticed how hard it is to find that fir`st mushroom but after finding it you start seeing more of them? Many mushroom hunters leave the first one in place while they search all around it for others. Whether they know it or not, they are training their eyes and brain to block out the background and detect the mushrooms hidden within the brush and leaves. They are imprinting. T he problem with this method is you may pass over many mushrooms before finding that first one but you don’t have to pass those first ones over! You can imprint before starting the hunt. Here’s how. Some hunters will tell you to stare at photos of mushrooms but there’s a better way. Morel Decoys! Decoys are carved or cast replicas of morel mushrooms. You can find morel decoys that are molded from real morel mushrooms in The Morel Store which make them extremely realistic. A few weeks before mushroom season you can use morel decoys by having a friend or spouse hide them in your yard or even about the house. Your eyes (and brain) will get used to detecting them. This method can really help you find that first shroom! 4. Hunting the Trees – Successful morel mushroom hunters seem to fall into two groups. Those who look for certain varieties of trees (tree hunters) and those who look for distinctions in the lay of the land. The dead elm is a favorite among the “tree hunters” but many also swear by hickory, ash, or sycamore trees. Some even say there is a symbiotic relationship between morels and the trees. This is certainly true of many types of fungi but since morels can sometimes be found growing in a treeless yard, patch of moss, or on a muddy bank, it is hard to prove this theory. However, the continued success of many “tree hunters” cannot be denied so this method should not discounted. One tree hunting method in which almost all avid mushroom hunters agree is that old apple orchards produce morels. If you are lucky enough to hunt an area with old apple trees, check it often. Don’t give up on it as many times the large yellow morels which grow beneath them will appear about a week after everything else is gone. here. Many morel mushrooms are found in these areas so do not discount this method. We hope this article helps you find more morels this year. There are many seasoned morel hunters who will offer up really good tips and tricks of their own in addition to those above. Feel free to comment or jump over the forum page and add your thoughts. For additional reading, check out the Into The Woods page for a collection of tips, ideas, and suggestions for a successful hunt. For photos of the various morel varieties check out the Morel Varieties Gallery. Read the blog post on The Life of The Great Morel for information on the morel’s journey in life and the impact the weather has. Informative, Research, Worthy of Reading 5 tips, hunting tips, morel hunting, morel hunting tips. permalink.